A key ring keeps these 6 nylon-bristle brushes handy when it's time to clean your stuffer tubes, grinder plates and everything else associated with your home butcher shop! Great for cleaning stuffers, slicers and grinders. 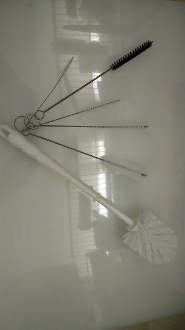 The 6 piece brush set is indispensable when it comes to cleaning food processing equipment. With a variety of brush sizes to choose from, the extra-long handles for those hard to reach areas, rugged construction and stiff bristles, you're sure to leave your equipment sparkling.